Plays and looks just like the original handheld game from the 1970s. Finally the return of Classic Football! First released more than 20 years ago, this is the electronic handheld football game that every guy remembers and loves. 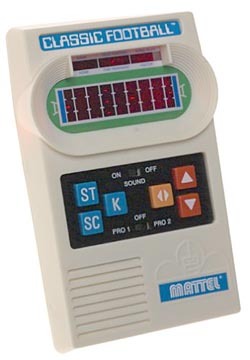 The Classic Football game plays and looks just like the original handheld game from the 1970s. Red LED segments allow players to move back and forth across the field as the quarterback avoiding virtual tacklers to score the winning touchdown. It’s a great game to bring on those summer vacations or perfect as a holiday stocking stuffer.